Abbey has had a great time this week at Science Camp. They've gone to the Morehead State University Space Science Center. They've made tons of cool toys. Today's toy was a robot. 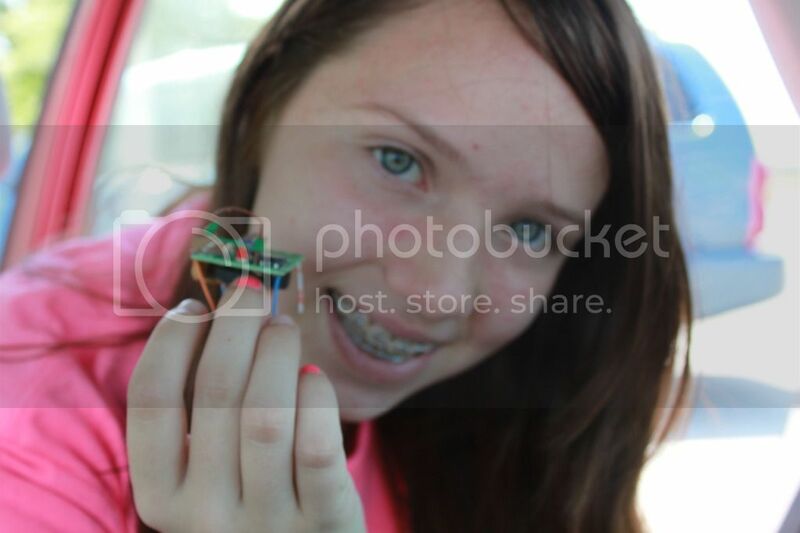 Here is Abbey holding her lil robot. Tomorrow they are taking a field trip to Cosi in Columbus OH. I got woken up by Abbey today. She was begging me to go home (30 miles away) get her swim suit and bring it to her at camp. She is going home with a friend today and since it is melt your face off HOT here, they are going swimming. I, being the good mom that I am, took her the swim suit. Actually, I took all of her suits so she could pick out the one she wanted. My reward was a big hug and kiss in front of all 24 other campers and their parents. Yup I got some envious looks, from the parents who stopped getting acknowleged much less hugged and kissed in public, by their kids years ago. I know my days of being the best mom ever are numbered. Believe me I am enjoying them while they are here. I still miss my Emmy and can't wait until Saturday morning when I pick her up from my mom's house. I am sure she is having big adventures there.